(a) Engage the guide and install the rear door upper window frame moulding to the door frame. (b) Using an air riveter or hand riveter with a nose piece, install the rear door upper window frame moulding with 5 new rivets. 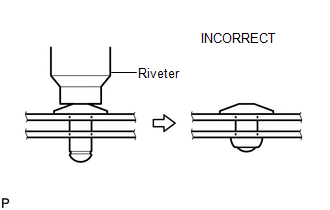 Tighten the 5 rivets in the order shown in the illustration. If the rivet cannot be cut, pull it once and cut it. 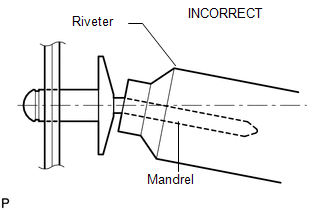 Do not pry the rivet with the riveter, as this will cause damage to the riveter and mandrel. Confirm that the rivets are seated properly against the moulding. Do not tilt the riveter when installing the rivet to the moulding. Do not leave any space between the rivet head and moulding. Do not leave any space between the moulding and door frame. Firmly hold the 2 items together while installing the rivet. 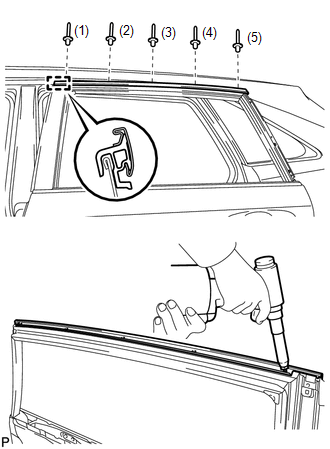 (a) Engage the guide and install the rear door rear window frame moulding to the door frame. (b) Using an air riveter or hand riveter with a nose piece, install the rear door rear window frame moulding with 3 new rivets. 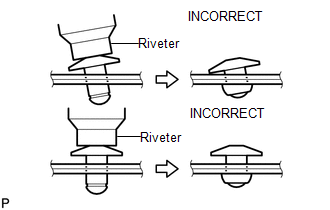 Tighten the 3 rivets in the order shown in the illustration. 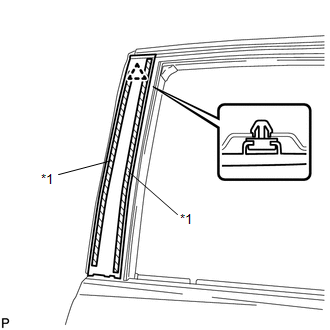 When installing the rear door front window frame moulding, heat the vehicle body and rear door front window frame moulding using a heat light. Do not heat the vehicle body or rear door front window frame moulding excessively. 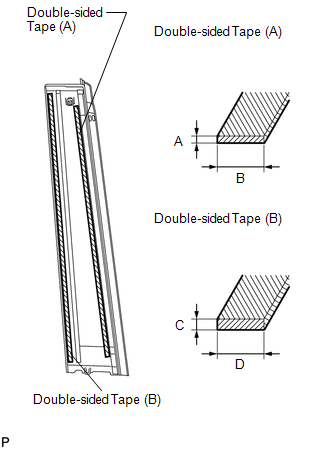 (2) Remove the double-sided tape from the vehicle body. (3) Wipe off any tape adhesive residue with cleaner. (b) Clean the rear door front window frame moulding (if reusing the rear door front window frame moulding). (1) Using a heat light, heat the rear door front window frame moulding. (2) Remove the double-sided tape from the rear door front window frame moulding. (4) Apply new double-sided tape to the rear door front window frame moulding. (c) Install the rear door front window frame moulding. 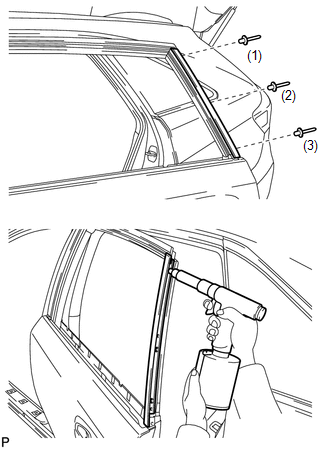 (1) Using a heat light, heat the vehicle body and rear door front window frame moulding. (2) Remove the peeling paper from the face of the rear door front window frame moulding. After removing the peeling paper, keep the exposed adhesive free from foreign matter. (3) Install the rear door front window frame moulding with the clip.